Winter has well and truly arrived, and along with colder weather, it has brought an increase in the spread of infection-causing germs. Below is your guide to some of the more common childhood infections that frequently occur in the winter. are caused by viruses, so antibiotics (which only kill bacteria) cannot help, as they are not effective against a viral infection. 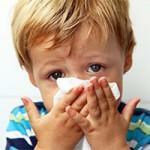 Most school-age children catch between 6 and 12 colds each year. The common cold often starts with a sore throat, and other symptoms gradually develop over a few days. It typically gives you a runny and/or stuffy nose, but may also cause fairly mild symptoms of tiredness, muscle aches, a cough or a headache. A cold usually lasts for around seven to ten days. Unfortunately, the only real cure for a common cold is to wait until it has run it’s course. Some over-the-counter products are available to treat your child’s symptoms and boost their immune system. Ask your local DCO pharmacy for the right product for your child. Although it is also a viral infection, the flu is more serious than a cold. Symptoms come on very quickly and severely, and include exhaustion, a high fever (>38.5 degrees Celcius), body aches, chills and sweating, sore throat, headache, and a cough. It can result in serious health problems and hospitalisations, especially in very young children. Immunisation can protect your children from the flu – it’s a good time to get vaccinated now! Anti-viral medicine (available with a prescription) is only helpful in the first 48 hours of an influenza infection, so it is best to consult your doctor at the first sign of symptoms. Paracetamol and cough medicine can help to reduce symptoms – ask at your pharmacy for advice. Bed rest is essential to help your child recover; and, to prevent dehydration, a rehydration formula can be useful. A chest infection is an infection that affects your lungs, either in the larger airways (bronchitis), smaller breathing tubes (bronchiolitis), or in the tiny air sacs (pneumonia). Bronchiolitis is a viral chest infection that affects babies up to twelve months old. It starts as a cold, but within a few days, breathing becomes rapid and the baby will cough and wheeze. The cough can last up to three weeks. Bronchiolitis is often confused with asthma, as the symptoms are quite similar. Antibiotics will not help with bronchiolitis, as it is a viral infection; however, you can treat it with rest, fluids, and paracetamol if required. Bronchitis also starts like a cold with a dry cough, which later becomes productive, with white, yellow or green sputum being coughed up. The initial infection is most often caused by a virus, which may resolve with simple rest and fluids; however, a secondary bacterial infection (infectious bronchitis), usually requires a course of antibiotics to kill the infection. If your child suffers from a high fever (>38.5°C), or is particularly unwell, see your doctor for medical treatment. A blue tinge to the lips and nail beds, due to a lack of oxygen. When the middle ear area becomes inflamed, it is called otitis media. This often happens during or after a child has a cold as the Eustachian tubes can become blocked, leading to a build-up of secretions and bacteria inside the middle ear. The signs and symptoms include ear pain (a young child may tug at the ear or seem upset), fever, appetite loss, temporary hearing loss, and ear discharge (if the eardrum ruptures). Around half of all middle ear infections will clear up on their own within 2 or 3 days, even without treatment. This means that your doctor may recommend a "wait-and-see" approach, which involves giving your child simple pain relief (such as paracetamol or ibuprofen) to help reduce the discomfort of an ear infection without antibiotics for a few days. Since most cases are caused by a virus, antibiotics often won’t help, as they don’t clear the fluid nor relieve pain. Ask for advice from your local DCO pharmacist if you suspect your child has a middle ear infection. of the throat. As part of our immune system, they are prone to getting inflamed and infected. Symptoms of tonsillitis include sore throat, pain when swallowing, bad breath, fever, swollen lymph glands under each side of the jaw and white or yellow spots of pus on the tonsils. When tonsillitis is caused by a virus, treatment is aimed at relieving pain and fever symptoms. Paracetamol or ibuprofen can help and the child should rest. Because it hurts to swallow, cool drinks and foods (ice blocks, yoghurt, custard, or ice cream) can be easier for them to swallow. Don’t worry if your child doesn’t eat much for a few days, they will pick up quickly when they recover. If tonsillitis has a bacterial cause, a course of antibiotics will be necessary to kill the infection. See your doctor if your child has symptoms of tonsillitis. This highly contagious infection can now be treated by your pharmacist! or inflamed, you have conjunctivitis. It is common for children to develop conjunctivitis when they have a cold. waking. Sometimes the eye will be sore, watery, or feel gritty. Conjunctivitis can also be caused by viruses or allergies, with similar symptoms. cause – ask at your local DCO pharmacy for the right product for your child’s eyes.